Hello everyone. Every three months I completely cleans my house and renew the protection on the place. I figured I'd post a few of the tricks I use here both for critique from my elders and betters in hoodoo and to give those with less experience a starting place for their own protection work. Let me start by saying that I believe that protection work is some of the most important work one does, if you don't keep up with your defense, well it just won't be a very good thing. Now the first thing I do after cleansing the house is to go and dress the rooms with Fiery Wall of Protection. A pinch of the powder in each corner and one in the middle of the floor. The windows get dressed with the oil, again a dab at each corner and another in the middle. The four corners of the property are nailed down with railroad spikes and I go and urinate on them. The four corners of the house get dressed with more Fiery Wall of Protection. Along the outside of the house, one on each side theirs a small round mirror to reflect evil, those get brought in and washed and prayed over before going back out. The front and back doors get dressed same as the windows. The door mats get a powder put under them, its Fiery Wall of Protection mixed with salt and fillings from a sliver dime. I was taught to put that under the door mat to keep evil people from entering. That's basically it as for what I renew every three months. I do have a couple other things, boxes of Red Devil Lye buried under the house, and a devil pod over the front door, but the pod gets anointed every week. So yeah that's basically it, sorry for the kinda scatterbrained format, I'm just not very good at typing out things If anyone has any advise on what you think I should or shouldn't be doing please let me know, any questions are welcomed. I hope this can help the people out their that don't have any protection going to get some up. Thank you ms.cat, coming from you that's a big complement. I have used it to protect myself from unpleasant people and it worked well for me. If you are dusting floors, doorways, or rugs, be sure to mix any sachet powder you buy with some local dirt so that it is not highly visible. I plan on making my first purchase from LM tomorrow and have a question about the Fiery Wall of Protection powder. If I want to use it to sprinkle in the corners of each room and I have a 10 room house would one packet be sufficient or should I order more? This doesn't include closets...should I do those as well? If you use a small pinch of the sachet powder in each corner, one packet will likely be enough for the job you describe. Re: the closets, I would be more inclined to dress a closet that was, by its location, likely to be accessed by outsiders (like an entryway coat closet, for example), or if I suspected that there was a good chance that someone might try to access them just in general (houseguest, landlord, friend of another family member, etc.). I think it's saved my life on one occasion, it's pretty powerful, i've used it in my front yard and it kept my ex girlfriend away. I ordered this wonderful satchet powder and the results that I have seen have been nothing short of phenomenal. Let me elaborate, I am working in a pretty stressful situation where my company is going through a very active period where everyone MUST perform or meet with unwished for consequences, this environment has caused very short fuses around the office. Now, there have been some situations that I have been exposed to where these same anxious people could have been short with me, but when it comes to me, vs. others they are calm cool & collected, even kind. I got into an unforeseen confrontation with a close friend who was being unreasonable and she instantly apologized. The Fiery Wall of Protection seems to protect you from harm, stress and argumentative people. For those who are curious, I mix the satchet powder into my lotion and put on myself. Very interesting results! Thanks for sharing. I have a blessed St. Michael medal that I wear for energetic protection 24-7. A traditional native Mexican shaman told me that with my healing practice I needed to wear some form of protection all the time, not just during treatment sessions - so I got this and had it blessed and things have been much better ever since. I recently felt that I needed to start providing it with a little extra "oomph", so on Sundays I've started praying the Prayer to St. Michael over it during the planetary hour of the Sun, while annointing it with Fiery Wall. This definitely seems to have kicked it into high gear. I also keep a white 7-day dressed with Fiery Wall in my healing studio, and whenever I'm in there for classes or treatments it gets lit to provide extra protection there too. I definitely am enjoying that oil! I love your idea about using the sachet in your lotion to dress yourself! You don't find that the powder clumps up in it, or do you just use very little? what if i live in an apartment. where do i put the nails? Well you can nail down a room with square cut nails available from LuckyMojo. yah i got the spikes but i am living in an apartment with concrete floors. Well then you can't do that part can you? Theirs no work around to having concrete floors lol. In much of southern West Virginia (and perhaps elsewhere) a common sedum plant known as "hens and chicks" is kept on the homeplace for protection against lightning, fire and theft. These are pretty, hardy plants -- easy to find and grow, indoors or out. One cares for them much like an aloe or other succulent plant. My take on this has been to write out my petition for protection (you could annoint it accordingly with LM's Fiery Wall of Protection and/or add in some protective herbs such as Blessed Thistle) then bury your petition along with some graveyard dirt and pot up your hens'n'chicks. Viola! Pretty, functional and discreet protection for your home. Note: I like to use dirt from my Dad's and Popaw's (that's hillbilly for grandfather ) graves as they were very protective of me. The hens'n'chicks, once potted up and empowered, also make wonderful housewarming gifts or can be sent with students off to college. After a season or two, your plant will have "babies" -- these can be kept intact on the original plant or removed and added to a new pot. I would suggest repotting the plants once a year and renewing the spell. With very little care, and the judicious repotting of the "chicks" one can have an ongoing supply of these lovely little garden guardians. Hope you enjoy! I am new to hoodoo, but my practices for the most part follow very similar traditions -- I'd love to hear how any of you may choose to make use of this Appalachian folk practice and incorporate it into your Rootwork tradition. Camphor is a cleanser, it doesn't protect. A better option if you have concrete floors is to drive small tacking nails into the corner of the skirting boards. I have cut'n'paste it to my selection of good ideas in my own word doc. Where do u get the railroad spikes from? One other thing i do annually is to clean the house in 13 days in the waning phase of the moon and on these days i try to do the 13 herb bath also.In the final stages I mop all floors with ammonia and then the chinese wash etc. I heard this from another rootworker and it just appealed to me...however i just used to do it once an year...as my spring cleaning ritual..maybe i should do this more often. Also @ copperfox: where can I get this plant from? I am in Ohio so approx same planting area? It sounds very interesting and i am cultivating my green thumb these days...i also love potted plants! 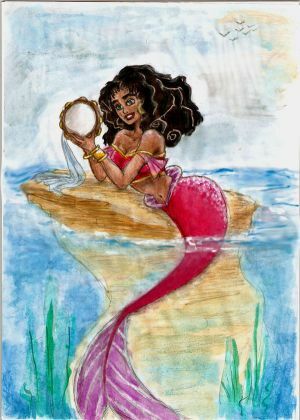 Someone who lives in a city with three people and does a lot of work (including revenge work) will need to cleanse/protect more often than someone that lives alone in a sparsely populated area and does very little work, and all of it of a positive nature. Someone who lives in an area where there is a lot of criminal activity would want stronger protection than someone living in a small community where there is very little crime. Once a year is fine. More often is fine too. However much you think you need to do. Actually, setting four pieces of camphor in the corners of the room, sometimes with a silver dime on top, is an old trick for protection and sealing a room. Just saying. Wow. I've never come across that one before. I guess that's my something new for the day. I'm guessing because of the pungent smell, it's use as a protecor would be similar to the practice of placing garlic in windows and doorways to stop bad spirits from entering. Now that I think about it, it makes perfect sense. I just have to say HailDiscordia you are awesome! I just love reading all your posts - they are very informative for rookies such as myself. Re camphor - I purchased LM's camphor incense & mixed it w/LM dragon blood that I broke down into a powdery substance. It helps to cleanse out my apartment, as well as (I intuitively feel) keep out external influences/vibrations. I also burn it on my front door step so that it travels down the hallways of the floor I live on. The after effects create a lot of peace, cease the slamming of doors and seem to lighten heavy foot traffic. I love LM's FWP products and always have a FWP candle burning on my altar w/pictures of my nieces and nephews, me and my mom, my brother and sister-in-law surrounding them, and FWP powder sprinkled across our pictures - a small St. Benedict cross (anointed w/LM cast off evil oil) in front of the pictures w/a LM devil's pod & devil's shoe string, and Archangel Michael card. I pray to this candle altar daily, using PSALM 91 & I have many reasons to believe this source of protection is highly effective, not just on me (who wears FWP oil to work everyday as well), but also protects the little ones in my family. For as long as I live, I will always have a FWP altar (God-willing). I also sprinkle fern leaves across my window seals & keep elder flower hung above my windows for protection. The outside of these areas are sprayed w/a combo mix of LM products including buffalo ammonia diluted in water and protective herbs, w/a dash of peace water added to the mix. So far my little apartment remains as peaceful, protected and blessed as can be. Great advice! Growing up in the south as a child we did a top-to-bottom thorough cleaning of the house, yard, vehicles, etc. Everything got a going thru and a cleaning. Nothing magical there - just good hygene. But as an adult, with magical interests, I read and learned to "add" more to this by "cleansing and protecting" at the same time or any other time I felt it needed it. Use your magical items, as well as regular around the house items that are also used for magic - according to your own supplies/needs and experiment. For example I bless/cleanse/protect the yard by blessing the tools ahead of time that I will be working with. No one is the wiser. You can say a little prayer/chant/etc over them also so that as the tool moves it will add its "magic/power" to whatever it is touching (plant, ground, fence, pots, etc.) This way anyone who sees you will only see someone doing yardwork, nothing more. taking care of the ant problem (or crickets or whatever were in season). Usually no one asks anything. I even did this on a military base I lived on years ago with no problems from anyone. I was wondering if urinating into a cup and then pouring the urine on the railroad spikes work as well as urinating on them directly? I live in a neighborhood that won't allow me to. My backyard is fenced and private, but my front yard isn't and I'm constantly watched by neighbors , thus, I was wondering if it would make a difference. Thanks much! Well when I wrote this post I was living on my own out of the city so it wasn't a problem for me. But yeah, doing it from a cup would be fine. Hi, I just purchased some fiery wall of protection sachet powder and I was just wondering do I have to perform the spell or can I just use the powder? If I can just use the powder how am I supposed to use it on my home? Should I wear it? Or can I just sprinkle it around my home and will that do it? Any insights on how to use this powder is greatly appreciated. Thanks. Depends on what you're trying to do with it. After cleansing your house you can place a pinch of the power in each corner and then in the middle (under a rug or piece of furniture if possible so it will stay in place) to help protect your home. You can also wear it on your body if you want personal protection. Just pray your intent over it as you use it. The oils, powders, incense, etc can all be used separately. They can be combined into a larger spell, but can also be employed separately. You can annoint a protective talisman/amulet with the oils, you can powder yourself with the powder if you are going to meet someone confrontational, you can sprinkle around your house etc. The oils and powders tap into the powers and conditions sought via roots and curios while your intent shapes the energy. THANK YOU so much Hail Discordia for posting this info,this is what i need to do! It is greatly appreciated. A few questions, do you drive the railroad spikes all the way in the ground? And can you mix your urine with your significant others to pour on the spikes? Just wondering if that would make it stronger. you are so right! ...Especially about the "who you live with" and "what kind of energy you're drawing in". Even once the bad people you lived with are gone there's still so much residual negative energy, feelings, etc., that it takes some serious work to free oneself, family and home of it. This is both an idea and a share. I had my drivers license renewed today. For all of you renewing online...enjoy it while you can, because you will have to go in and retake the picture and provide everything under the sun if you were ever married or had a different name and kept your name, or never switched back. Anyway, my State is one of the first of All 50 to kick off the new guidelines. Just an idea and I thought I'd share. Good information to share Tripletreat! Thank You! could I use firey wall of protection on a red candle with fever few to prevent injury? What would I need to use to place a fiery wall of protection around me somehow without throwing dirt on my rugs? Even a little bit of dirt would drive me crazy and I would to want to vacuum it up in a hurry. I live in an apt building and my entire apt has wall to wall carpeting. I do not know what spell you are looking at, but the Fiery Wall of Protection spell as detailed here: http://www.luckymojo.com/fierywall.html does not have you throwing dirt around. Neither, I believe, does the Fiery Wall of Protection spellkit. In Miss Cat post she uses dirt to pix with the powder so that is where my question came from. I wouldn't, powders in oil just makes a nasty mess. You can certainly powder yourself with it tho, no need to try and make it into an oil. Powdering yourself after a bath is good, traditional work. Thank you so much. I am looking forward to using LM products and getting out from under a crossing and being better protected once it has been lifted. The man who put this on me has been cursing objects that I've purchased or he has given to me from his occult shop where he claims to be a high priest and teacher but he is in it for his own gain and has abused many. If I were more adept I would lay tricks on him myself(he deserves it) but I would likely get into deeper trouble with him so for now I need to cleanse and then use the Fiery Wall of Protection to keep him out. I would have purchased the complete kit...it includes everything from cleansing to protection. You may also want to consider a worker to tackle this situation...have you reviewing http://www.readersandrootworkers.org? Yes thank you, I intend to get a more thorough kit as well as some assistance from a rootworker. I have the page you suggested bookmarked. Sadly this guy had been attacking my finances and blaming it on other people for a while. I did what I could to protect it and I think it weakened his blows to a point but the guy works very hard at attacking people and he has been doing this a long time. Anyway sorry for the rant, basically my finances are limited because of him. His business was failing while mine was succeeding so he went to work on that. Because of that I can't afford to buy all the things I truly need so I'm just doing what I can for now. I also plan on taking the 52 week course when my money is right again so I have a better understanding of how to handle things like this. Not sure if this topic belongs here. Apologize if in the wrong section. This morning, as I was gathering some of my powders/oils, my oil bottle of FWP fell from my bag and broke on my bathroom floor. Tried to salvage some of the oil but also stepped on a large piece of glass and bled for quite a while. Was sadden about what happened. Also, have not yet cleaned it up. Any thoughts on what to do and how to dispose of the remaining oil on the floor as it has quite a bit of pieces of glass. Just wanted to report that I had purchased FWP from luckymojo some time ago for protection from an individual who had been hexing me. I found it very helpful in that situation but I also have a nightmare nieghbor... always partying, shooting guns for hours on end (i live in the boonies) always talking about me to his drunken buddies as soon as I step out my front door etc. Anyway I realized I still had some FWP satchet powder and decided to lay down a line between our properties in the location where he peers over to see what we are doing over here. The results were instant and ongoing. I have not heard a peep from them since the moment I did it. I have not been able to shut them up for 3 years until I used FWP. I was gonna hotfoot these people but if the fiery wall of protection is gonna make them behave, I'm quite happy with that result. I just realized I've been so busy researching and asking questions that Iv'e been neglecting this (customer testimonial) part of the forum. I first used this powder (FWP) the summer of 2011 with the intention of keeping the "maniacs" away from me while driving. I had sprinkled the powder under my car mats early that morning and later on my neighbor asked me to take her to the store. About a mile into the ride I look into my rear view mirror to see this car turning onto the street we were on, screeching and spinning like a top so I immediately speed up to turn onto a side street because I didn't know if this person was on drugs or having a siezure behind the wheel ect. Within a millemeter of a second the car was right on my bumper. But what was so crazy y'all was that he was going full speed!!! I mean he really put the pedal to the medal!!! Needless to say we were terrified. Long story short, I turned into an alley, my nieghbor's and my heart beating like crazy, barely catching our breath. I go, "What the hell was that all about!?" She says, "Girl, I don't know, I'm still trying to figure out why he didn't hit you!, he was right on your bumper going 100 mph (seemingly) God was with you". I didn't say anything about the FWP powder but I just sat there in a daze for about 2 minutes. Even though he was racing and right on my bumper it was like a "force" was stopping him from actually hitting me!!! Thanks for the testimonial. I am glad you were kept safe! Can i use it in my house for protection against thief ? Yup you can use the spell kit or the powder. their are many traditional ways to use the FWP product baths to protect you, can dissolve the salts in water and use it as a floor wash, put the powder or oil on windows door knobs etc. you can make protection mojos like the FWP spell kit to protect from it, burn candles dressed with the oil and double dressed with the powder.. I think you get the idea! I finaly use it and i can tell this powder is very powerfull.Let me tell you the story,my mother have some bad spirits arround her when she sleep,them make a lots of noise in the house,sometimes them make her feel so sad and she have some problems for sleeping well.I put a bit of this powder in the four corner of her room and one under the bed.Since that,no bad spirit never enter in the room and she sleep very well.Thanks luckymojo for this nice product. I just got my FWP sachet powder yesterday. I brought it into work this morning and sprinkled the perimeter of my cubicle, sort of rubbed it in the carpet with my feet so it was not noticible and then sprinkled some crown of success powder within my space. I noticed an immediate difference. We have a drama queen on the floor and it is keeping her away. Ahhhh....nothing like a stress free Friday!!! Thank you Lucky Mojo!!! I am trying to nail down my house, but I got Fiery Wall of Protection Powder instead of the recommended Oil. Can I use the Fiery Wall of Protection Powder, and mix the Fiery Wall of Protection Powder with the Influence Oil that I ordered together, to nail down the house? I am new at these efforts so I am not sure what to do if I ordered the wrong thing, but I am trying to nail down my house, since a decision can come in at any time regarding whether I will keep my home. 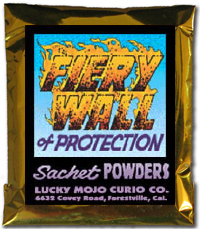 Yes, you can use the Fiery Wall of Protection Sachet Powder. It is designed to sprinkle around the property, all along the peritimer. Mix it with dirt so that it will not stand out or be obvious. Use the oil to dress the nails. Hello everyone! I just got my FWP yesterday. With some uncrossing sachet,money spell,love spell. I mean would it be the last spell I do. Also I will like to know how many days will be enough to use it,should I finish the whole sachet. Thanks,looking fwd to get a reply. Use the fiery wall of protection IMMEDIATELY after using the uncrossing. Use the Fiery wall of protection thereafter when you feel a little weekend as if you may need some protection. I am kind of in a rush and didn't have time to read throughout this whole thread, so please forgive me if the question has come up before. What I intend to do is to put something around my yard that will repel any would be intruders. I have a fairly medium-large lot out in a semi-rural area. We have security cameras but that alone will not actually repel intruders from entering our yard, at least not the ones we have at the time - I hope you get what I'm saying. So my question is, would something like the Fiery Wall Of Protection sachet powder sprinkled around the 4 corners of the yard be enough to suffice for this job. Or would it be better to use something else that I could possibly bury in the yard instead. Something more permanent?